A whiteboard, dry-erase markers and curiosity can sometimes be the most powerful tools in the scientific toolkit to solve America's biggest challenges. And few problems pose as serious a threat to the environment or human health as mercury contamination. For centuries, this toxic chemical element was used for industrial activities, such as gold and silver mining, and it continues to be a common byproduct of coal-powered power generation. Today, it is also used in manufacturing, batteries, and a myriad of products. The dire public health consequences of mercury contamination, combined with decades of improper handling and disposal, made cleanup a national priority. In the summer of 1996, the Department of Energy challenged the scientific community to develop new and more effective ways to remove mercury from the environment. Across the country, in a quiet corner of Pacific Northwest National Laboratory, a scientist contemplated that DOE challenge. Dr. Jun Liu, who was studying the synthesis of mesoporous materials, got up from his desk and walked next door to see Dr. Glen Fryxell, a synthesis chemist who was focused on a DOE Office of Basic Energy Sciences-funded research on biomimetic coatings. Liu asked if, by combining their respective areas of expertise, they could efficiently remove mercury from water and industrial waste streams. The two scientists started scribbling on the whiteboard and quickly reached an answer. Yes. 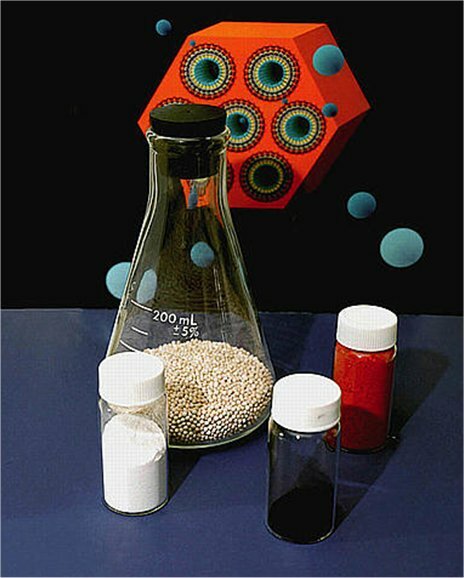 Fifteen years later, Fryxell holds a small glass jar containing a white powder called SAMMS®, short for Self-assembled Monolayers on Mesoporous Supports. This material answered DOE's challenge by easily remediating mercury content from the environment without creating hazardous wastes. As an added bonus, the molecularly engineered material was much faster, less expensive and for more effective than mercury remediation methods of the past. A Cross-Cutting Technology: "As a multi-disciplinary laboratory, we are fortunate to have people with expertise in a variety of disciplines. A cross-cutting technology like SAMMS relied upon capabilities from across PNNL and the contributions of many people," said Fryxell. The early development was led by Dr. Xiangdong Feng, with Liu's team leading the design of mesoporous materials, tiny silica particles with even tinier pores designed to trap contaminants. Fryxell, meanwhile, synthesized and installed ligands, or binding molecules, to attract and hold the mercury. "From an early stage, our testing supported our concept, and we were able to show tremendous results," said PNNL engineer Dr. Shas Mattigod, who led much of the early SAMMS testing. 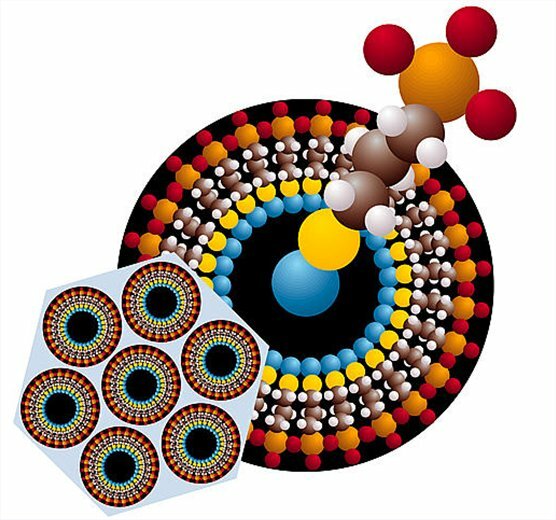 "The real learning curve was refining our process to uniformly coat the mesoporous material with binding molecules while keeping the pores open." SAMMS is created by attaching a single layer of ligands to mesoporous ceramic or silica supports. The highly porous material and resulting high surface area allows an extremely high density of binding sites. In fact, just five grams of SAMMS powder—about a tablespoon—have the equivalent surface area of a football field, with binding molecules fully covering the available surface. Together, these properties produce a product that, for mercury remediation, is about 500 times faster than previous ion-exchange resin methods and much less expensive than granulated active carbon methods when disposal costs are factored in. Limited Only by Imagination: In the years since it was developed for mercury remediation, the applications for SAMMS have multiplied. This breakthrough technology has found uses to treat groundwater, contaminated mining impoundments, industrial process streams, and even contaminated vacuum pump oil. SAMMS has been used to sequester a variety of contaminants, ranging from heavy metals like mercury, silver, lead, cadmium, and copper, to anions like chromate, arsenate, and selenite, and radioactive materials like radiocesium, radioiodide, pertechnetate and various actinides. SAMMS can be used for waste remediation and stabilization, water treatment, metal finishing and processing, ore beneficiation, catalysis, and more. The technology has received numerous recognitions and accolades, including an R&D 100 Award from R&D magazine in 1998. It was also recognized with a Technology Merit Award in 2005 from the Environmental Business Journal, an Industrial Innovation Award in 2006 from the American Chemical Society, and a 2006 Federal Laboratory Consortium Award for Excellence in Technology Transfer. In 2009, SAMMS was selected by Popular Science magazine as the Grand Award winner for Green Technologies in the magazine's prestigious Best of What's New Awards. Today, the applications of SAMMS continue to expand. It is being evaluated, for example, as an alternative to chelation therapy to adsorb heavy metal contamination from the body (heavy metal contamination is a concern for battery industry workers, welders, machinists, etc.). The U.S. Navy is using SAMMS to purify the air that submariners breathe, and a major pharmaceutical company has used SAMMS technology to recover expensive catalysts and purify its products. Should there be a terrorist attack with a radiological dispersion device, or a "dirty bomb," a novel formulation of SAMMS could be used by first responders to decontaminate the exposed skin and wounds of victims. Suspended in a gel, the product is painted onto the affected areas. When later peeled off, early testing indicates that SAMMS will remove 80 percent or more of the radionuclides. "SAMMS does these things, and more," said Fryxell. "We are continually energized by the applications that our researchers, our commercialization partners and the scientific community keep finding. The potential uses for SAMMS seem to be only limited by our imagination." New Markets and Applications: As research and testing continued and new applications for SAMMS technology continued to emerge, the PNNL team knew they needed a commercialization partner to bring the technology from the laboratory level to real-world application. "Our expertise is in fundamental research and development, not manufacturing and marketing," said Fryxell. "We needed a partner to bring the benefits of this technology to people everywhere." PNNL was very deliberate about the types of commercialization partnerships it pursued. As proof-of-principle testing, specific contaminants and scenarios were selected, testing was conducted to demonstrate the technology's viability, and the results of these tests were shared with potential partners. In November 2005, PNNL formalized a relationship with Tennessee-based Steward Advanced Materials. The smaller, family-owned company was a perfect fit for SAMMS and PNNL. "They were willing to dedicate their resources to make SAMMS a commercial success," Fryxell said. "They have the manufacturing and production engineering expertise, so we've been able to move forward together and develop the product." Moreover, Steward is manufacturing SAMMS sustainably. For example, rather than dissolving organosilanes in solvent to deposit ligands on mesoporous support surfaces, Steward and PNNL pioneered a process of replacing the solvent with supercritical CO2. The CO2 is re-used in a closed-loop manufacturing system. This creates a less-costly, higher-quality product that is ready to use with virtually no waste. In addition to finding new markets and applications, Steward is manufacturing SAMMS at high volume in several engineered forms that can be delivered with a variety of binding molecules for a growing list of targeted contaminants. The original SAMMS technology for mercury-removal from water and waste streams was modified to work with Steward's proprietary magnetic powder technology for magnetic separations. The combination of the two technologies captures mercury and removes it from process streams prior to being released into the environment. While SAMMS emerged from one impromptu whiteboard session, the PNNL research team has found great satisfaction in seeing the product mature and make real-world impacts in the environment and the lives of people. "SAMMS is one of those projects that harnessed fundamental science and continues to make significant and positive impacts on society," said Fryxell. "This is something that would only be possible with DOE leadership, the cross-disciplinary expertise of a national laboratory, and an excellent partner in commercialization." Key contributors to the research were Glen Fryxell, Shas Mattigod, Jun Liu, Xiangdong Feng, and Tom Zemanian. Select Publications: Feng X, GE Fryxell, LQ Wang, AY Kim, and J Liu. 1997. "Organic Monolayers on Ordered Mesoporous Supports." Science 276, 923-926. Zemanian TS, GE Fryxell, J Liu, JA Franz, and Z Nie. 2001. 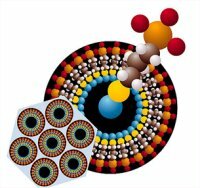 "Deposition of Self-Assembled Monolayers in Mesoporous Silica from Supercritical Fluids." Langmuir 17, 8172-8177. Lin Y, GE Fryxell, H Wu, and M Englehard. 2001. "Selective Sorption of Cesium Using Self-Assembled Monolayers on Mesoporous Supports (SAMMS)." Environmental Science and Technology 35, 3962-3966. Mattigod SV, GE Fryxell, RJ Serne, KE Parker, and FM Mann. 2003. "Evaluation of Novel Getters for Adsorption of Radioiodine from Groundwater and Waste Glass Leachates." Radiochimica Acta 91, 539-545. Zheng F, DN Tran, B Busche, GE Fryxell, RS Addleman, TS Zemanian, and CL Aardahl. 2005. "Ethylenediamine-modified SBA-15 as Regenerable CO2 Sorbent." Industrial Engineering and Chemical Research 44, 3099-3105. Fryxell GE, SV Mattigod, Y Lin, H Wu, S Fiskum, K Parker, F Zheng, W Yantasee, TS Zemanian, RS Addleman, J Liu, K Kemner, S Kelly, and X Feng. 2007. "Design and Synthesis of Self Assembled Monolayers on Mesoporous Supports (SAMMS): The Importance of Ligand Posture in Functional Nanomaterials." Journal of Materials Chemistry 17, 2863 - 2874. "Our challenge is to educate the public, including researchers, industries and agencies that a new technology is finally commercially available to clean up our environment at an economical cost."